Originally published in the Omaha World-Herald October 11, 2014. The most recent addition to Omaha Public Library came in August 2009 with the opening of the Saddlebrook Library, 14850 Laurel Ave. The 12th location of Omaha Public Library was built as part of a joint-use facility with Omaha Public Schools and City of Omaha Parks and Recreation. The building houses a library, school and recreation center all in one place to create a convenient facility that saves money and resources through sharing. Beringer Ciaccio Dennell Mabrey designed the Saddlebrook Joint Facility around a centralized hub that serves as a community commons visible to administrative or information desks of all three entities. One interesting and innovative goal of the building's design was to create a sustainable space. A partial green roof and rain gardens naturally filter any debris from rainwater, reducing the content and delaying its entry into the adjacent natural resources — a process that is visible through monitoring systems in the library and community center. 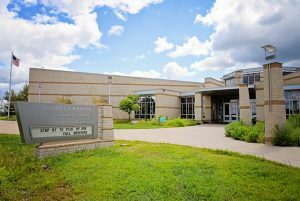 Saddlebrook Library occupies 11,900 square feet on the northeast corner of the building. A rotating bookcase divider provides separation of school and public space during the school day, and can rotate when school is not in session to allow for use by everyone. The library includes a computer lab, discussion room, study spaces, and of course, books! Popular programs at Saddlebrook Library include story times, book clubs and craft groups.